Tales of an Art Dealer was originally produced in 1991 to honor the gallery’s 150th anniversary. The video featured an engaging exploration of our history, including stories told by Robert C. Vose, Jr. (1912 - 1998), as well as his sons Terry and Bill Vose. The three Voses, with over a century of combined experience dealing in American paintings, spoke of eccentric collectors, fakes and forgeries, discovering masterpieces in unexpected places, and other colorful anecdotes of the art world. In 2016, to celebrate the gallery’s momentous 175th anniversary, we enhance the original tales with new narratives from the 6th generation, Carey Vose, and the gallery manager, Courtney Kopplin. To view the the newest additions to Tales of an Art Dealer, please click here. Back in 1989, we were discussing how to celebrate Vose Galleries’ 150th anniversary. I had recently seen a Ken Burns documentary/docudrama of the artist, Thomas Hart Benton, and was very impressed with the story telling and archival shots. Why couldn’t we make a similar documentary chronicling our 150-year history? We had the perfect ingredients to make a fascinating story that would appeal to many, not just art enthusiasts. My father in law, Robert C. Vose, Jr. (1912 – 1998), was a master storyteller who regaled us with his memories of art treasures in the attic, eccentric collectors, and other colorful stories of the art world. Eureka! Why not make a video about those topics, using major paintings the gallery had sold to museums and important collectors as the framework? And our extensive archives of ancient letters from artists, antique photos, diaries and account books could weave the galleries’ history into the stories. I traced the company that produced the Benton video, Multivision, right in nearby Newton and spent the next two years working with them and writers, narrators, production personnel and editors. My dream was to make a documentary video that would be suitable for public television, a feat that would be nearly impossible because the gallery is a commercial enterprise. But I felt that the story stood on its own, without resorting to commercial gimmickry, and only a family such as Vose, being the oldest gallery in the country, was qualified to tell it. I had no idea what an undertaking this would all be (often full time, including nights and weekends for me), but at the end of two years, we were ecstatic with the results. We premiered the video, aptly titled Tales of an Art Dealer at a benefit gala evening at the Museum of Fine Arts, Boston, and it was a thrill to see the piece shown on their movie-theatre sized screen. Over 225 people attended and we managed to raise $15,000 to benefit the museum! Most of all, people responded to the warmth and humor of the piece and were stunned at the magnitude of the galleries’ history. Convincing the powers that be at WGBH, Boston’s public television network, however, proved to be daunting. Even though the video was free of charge, they would not show a commercially produced piece, and I doubt that they had even looked at it. Although crushed, in time we thought about contacting the PBS station in Providence, Rhode Island, where the gallery was founded and remained for the first seventy years? Bingo! Providence’s Public television station WSBE loved the project and, under their sponsorship, the video was uploaded to the Eastern Education Network, a major programming service for PBS nation-wide. Over 150 station managers across the United States aired Tales of an Art Dealer, apparently an astounding number. And what about our lack of interest from the Boston PBS channels? They got in line and beginning in September, 1991, aired the program multiple times! 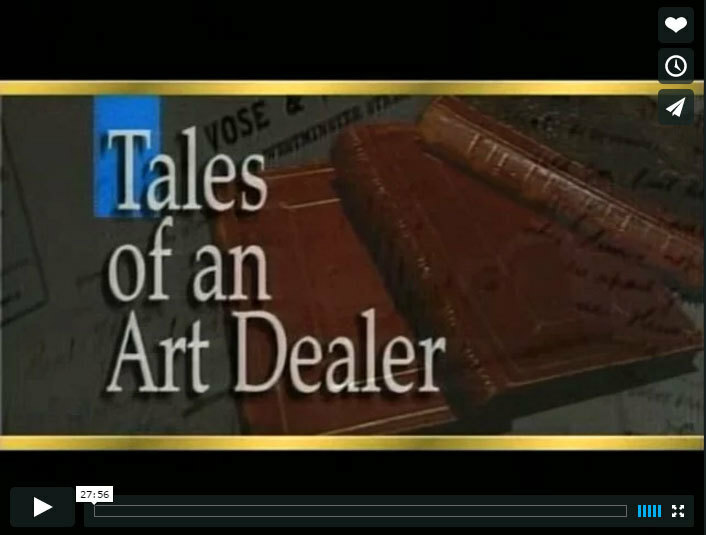 Tales of an Art Dealer from Vose Galleries on Vimeo.